Hirth gears are types of mechanical connections that are used to connect two pieces of a shaft to each other. Developed by engineer and inventor Albert Hirth, these gears have become essential machinery pieces for a number of reasons. They can take on very high loads, are self-centering, and maintain tightness in the joint. Hirth gears are used in various applications such as crankshafts, gas turbines, medical devices, machine tools, and agricultural machines, to name a few. Today, there are only a few companies that regularly manufacture Hirth gears. And, if you are looking for precision design, unmatched performance and long service life at a very competitive price, you need to take a look at Techna-Tool Inc. For more than two decades, Techna-Tool has been the leading provider of high grade engineered products as well as contact and non-contact tool monitoring systems. 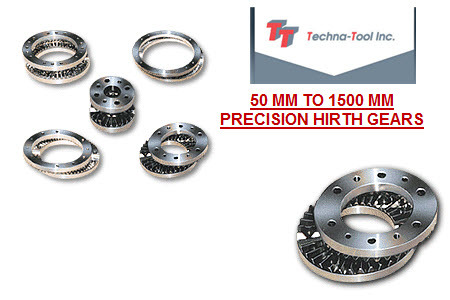 At Techna-Tool, we provide Hirth gears ranging from 500mm to 1500mm in diameter.The gears are manufactured using high grade chromium-molybdenum steel. We provide the gears with an inside diameter quality up to ISO h6. The indexing precision of the gears is ±1″, while the total height of the coupling can be measured at ±0.1 mm. Milling the Teeth: The gears are rough machined, thermally annealed and thermally stress relieved. Rough Grinding the Teeth: The gear’s faces and diameters are rough ground after induction hardening. Precision Grinding the Gear Surface: Both the inside and outside diameters of the gear surface are precision ground to hold accuracies. Inspection: After a final grinding process, the gears are thoroughly inspected before being shipped for delivery. The design and manufacturing process of Hirth gears provides them a number of benefits. The chromium molybdenum steel makes completely resistant to wear. The design and finishing of the teeth allow the two gears to couple tightly together and provide firm locking for machining forces. Techna-Tool gears havenegligible axial and radial run-outs. Precision design and manufacturing makes Techna-Tool’s Hirth gears the perfect mechanical product solution for a variety of industrial applications. This entry was posted in Precision Hirth Gears and tagged hirth-gears. Bookmark the permalink.